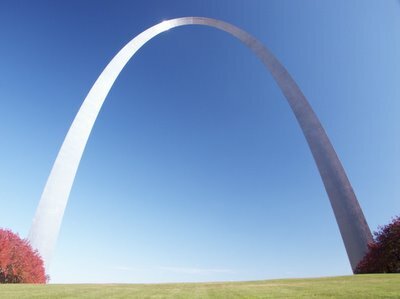 The Gateway Arch has been the symbol of the City of Saint Louis since its completion forty years ago last Friday. The monument is an impressive engineering and construction accomplishment. Its design is strikingly minimalistic: monochromatic stainless steel construction of triangular cross section, with a modified catenary geometric shape. Its sign value is also minimalistic: a portal to the West of the United States, showcasing the nation's wealth and technical ability. Its architect, Finnish-born Eero Saarinen, was until recently the most-hated architect in academic circles. He was considered to be insufficiently Modernist in his designs, and ironically was criticized as being too Modernist, being the architect of the Establishment. Also, he lacked a signature style, and so was uncategorizable; instead of being an egotistical "artist", he worked with the clients to determine their specific needs instead of imposing his "vision". 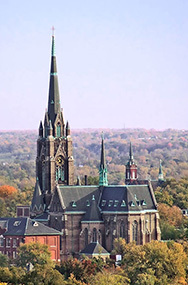 His designs for Protestant churches had sign value, and were recognizably churches. The culture war of the 1960s was won by the Radicals who rejected even the minimal symbolism of Saarinen's work. Subsequent architecture got worse: sign value went to zero, with the style of "Brutalism", which seemed to be made only for the purpose of crushing souls, then it went to playing jokes on the client in "Postmoderism". And now, sign value in architecture has become less than zero: an as-yet-unnamed trend where negative symbols are substituted for positive ones, a prominent example being the new Cathedral in Los Angeles, where the Blessed Virgin Mary is replaced by a pagan goddess, and pantheist images replace Catholic catechesis on the bronze doors. Saarinen's Arch is a product of its age, and it has aged gracefully. 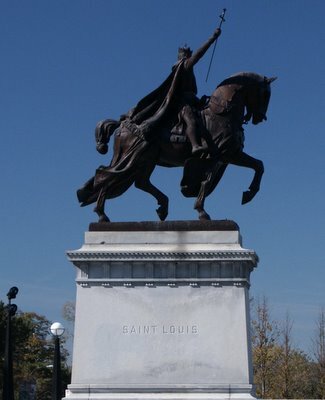 Previous to the construction of the Gateway Arch, this statue, the "Apotheosis of Saint Louis", was the symbol of the City. 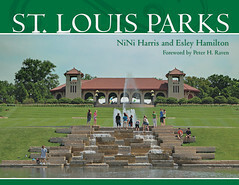 Originally designed by Charles H.Niehaus for the Louisiana Purchase Exposition, it was recast in bronze in 1906 and sits in front of the Saint Louis Art Museum. It is a statue of the Crusader King of France, Louis IX, and Saint of the Church. Saint Louis defended Christendom against the Infidel, built churches, schools, universities, hospitals, and orphanages, and reformed the legal system of France to use the same Natural Law basis as used in our country until the 1970s. He is a symbol of Christianity and of good government. Thanks for this. 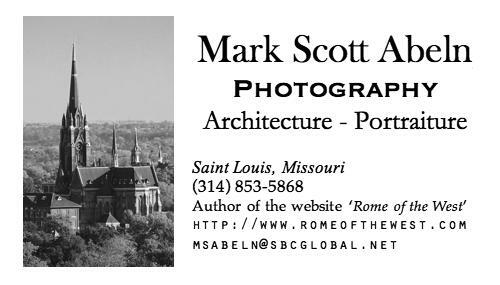 We moved to STL from California in 2000, and I fell in love with the Catholic history of the place, having been reared to love and respect the Spanish missions of California. I also like the arch a lot, tho I usually loathe the modernists. I suggest "From Bauhaus to Our House" by Tom Wolfe, if you have not yet read it. I like that book very much. It describes the destruction of tradition and ideas that brought us modernism.